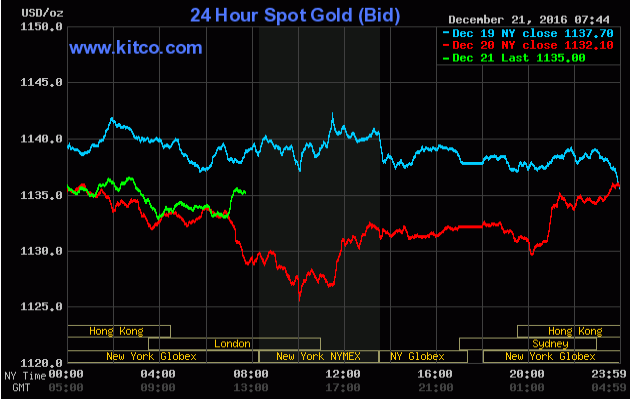 (Kitco News) – European stock markets were narrowly mixed Wednesday as markets activity begins to wind down ahead of the Christmas holiday on Sunday. Asian stock markets were firmer, led by China's Shanghai stock index that posted solid gains. A big China securities company on Tuesday said it would honor the fraudulent bond activities from two of its traders, and that calmed nervous investors. Many world stock markets are near record or multi-year highs and a pause from recent rallies is not surprising. Some veteran market watchers reckon the new year could start out with some hefty profit-taking pressure in the world equity markets, following their strong runups to end the year 2016. Gold prices are trading slightly higher on short covering and perceived bargain hunting after recent selling pressure that drove prices to a 10-month low. In overnight news, Sweden's central bank held its interest rates steady but extended its quantitative easing program at its latest monetary policy meeting. 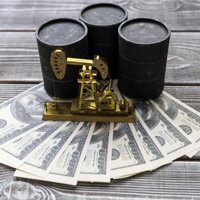 The key "outside markets" on Tuesday see Nymex crude oil prices trading modestly higher after hitting a 16-month high last week. 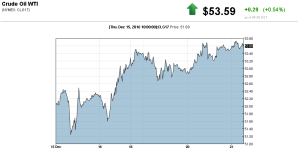 However, the Nymex oil bulls continue to struggle when prices are above the $50-a-barrel level. Meantime, the U.S. dollar index is modestly lower on some profit taking after the index hit a 13-year high on Tuesday.